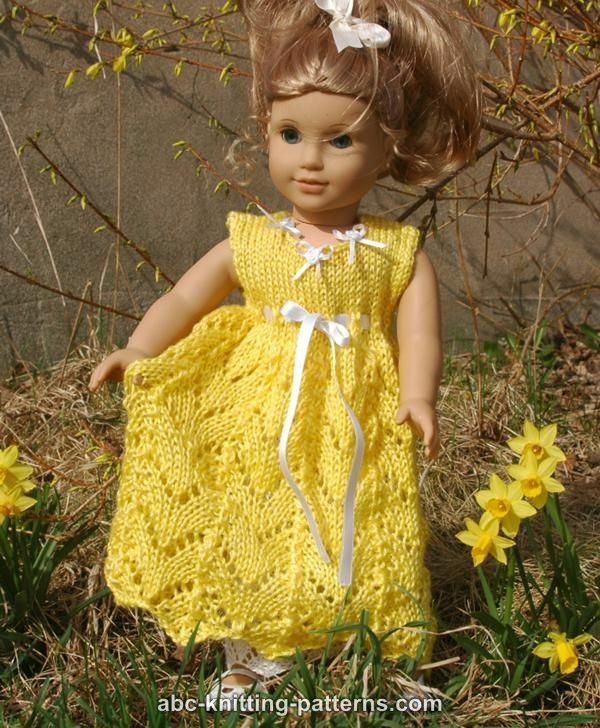 Your doll will love this dress! The skirt is knitted using a lace motif that leaves a pretty scalloped edge along the bottom. 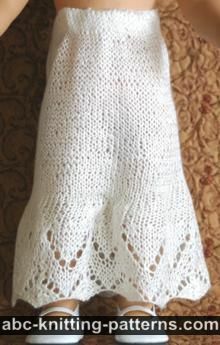 The lace motif is pretty simple and should be easy even for a less experienced knitter. 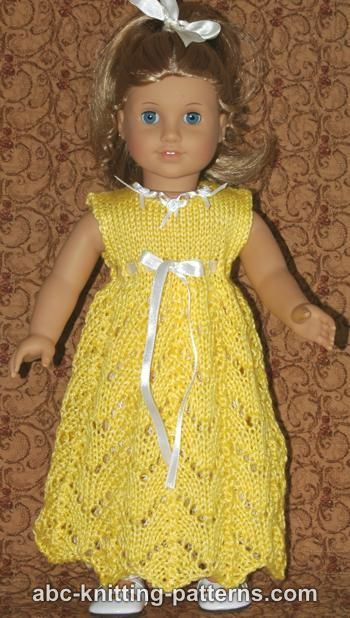 The dress is knitted from the bottom up, with seams in the rear and along the shoulders. It features a back closure. The high empire-style waist leaves you with many options. 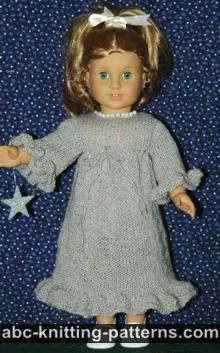 The full-length dress you see in the picture is made with 6 repeats of the lace pattern. Try knitting 4 or 3 for a more casual summer-length dress. 2 or 3 for a "Tinkerbell" look. Materials: Tencel Wool by Cleckheaton 70% Tencel 30% Wool DK weight yarn 91 m (100 yds) / 50 g - 2 balls. Needles: 7 (4.5 mm) and circular 5 (3.75 mm) OR SIZE NEEDED TO OBTAIN GAUGE. Notions: yarn needle, 3 sew-on metal or plastic snaps, 3 decorative buttons (optional), a 30" long piece of 1/4" wide satin ribbon, any small embellishments, like beads or satin flowers (optional), sewing needle, sewing thread the color matching the color of the yarn. 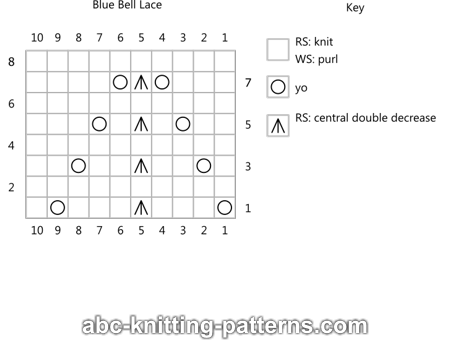 Gauge: One lace pattern repeat (10 sts) is 2.25" (6 cm) on size #7 (4.5 mm) needles. 20 st x 24 rows = 4" x 4" (10 cm x 10 cm) in stockinette stitch on size #5 (3.75 mm) needles. Multiple of 10 sts . Foundation row (WS) - purl. The dress is worked from the bottom up back and forth with the opening on the back, as one piece up to the armholes. Then the front and the backs are worked separately. The dress has back and shoulder seams. Using bigger needles, cast on 93 sts. Work the foundation row (WS): purl. Row 3 (RS): sl 1, k1, *k1, yo, k2, cdd, k2, yo, k2 - repeat from * 9 times, p1. Row 5 (RS): sl 1, k1, *k2, yo, k1, cdd, k1, yo, k3 - repeat from * 9 times, p1. Row 7 (RS); sl 1, k1, *k3, yo, cdd, yo, k4 - repeat from * 9 times, p1. Repeat rows 1-8 five more times. Row 49 (RS): sl 1, k91, p1. Transfer all the stitches to the smaller circular needles and block the skirt. Row 50 (WS): sl 1, p 92. Row 52 (WS): sl 1, p62. Row 53 (RS): sl 1, k61, p1. Row 54 (WS): sl 1, p62. Row 55 (RS, eyelet row): Sl, k1, *yo, k2tog- repeat from * 29 times, yo, k1, p1. Row 56 (WS): sl 1, p62. Divide all the stitches on the needles as follows: 17 sts for the right back, 29 sts for the front, 17 sts for the left back. Continue to work the front and the left and the right backs separately, either from 3 balls of yarn or one by one. Row 58 (WS): sl 1, p16. Repeat row 57-58 six more times. Row 72 (WS): sl 1, p9. Row 73 (RS): SL 1, k7, p1. Repeat rows 72-73 one more time. Row 76 (WS): Repeat row 72. Row 58 (WS): Sl 1, p28. Repeat rows 57 - 58 four more times. Row 67 (RS, shaping neckline): Sl 1, k9, bind off 9 sts, k9, p1. (= 10 sts and 10 sts). Continue to work the shoulders from 2 balls of yarn. Repeat rows 68 - 69 three more times. Row 76: Repeat row 68. Bind off sts of both shoulders, cut yarn. Row 71 (RS): repeat rows 57. Row 73 (RS): Sl 1, k8, p1. Row 74 (WS): Sl 1, p9. Repeat rows 73-74 one more time. Join the back seam of the dress from hem up to hipline, leaving 15 cm (6") open at the top. Weave in all yarn ends. Thread a length of ribbon in the eyelets at the waistline. Sew on 3 snaps on the bodice backs. Sew decorative buttons on the edge of the right back over the snaps (optional). Sew any additional embellishments (optional). Pattern was updated on September 5, 2018. There are 40 total comments on this article. Linda Shephard did you have extra stitches after the pattern was done for each row?? I have had extra stitches on the 4th, 5th and 6th rows. Does it fit a 18" doll. I am having the same problem, ended up with 4 extra stitches on the 4th row!!! Did you ever figure it out??? Please help! Basically, you are telling the stitches where to stay put. There will be a gap of time between when you knit the skirt and when you finish the top portion. During that time, you will basically wash the skirt and then pin it to a foam board to dry in the rectangular position shown in the images below. Once dry, you then start knitting again. what you see at the top of the image (black string) is the circular needle left in the work to hold the stitches until the work is dry. I just finished the dress and have the same question! I'm new to knitting and don't really know how to plan a buttonhole. Can you let me know if you found a solution? 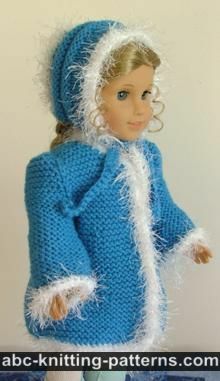 I'm making three of them for my granddaughters. The easiest way to make a buttonhole is to do a yarn over. 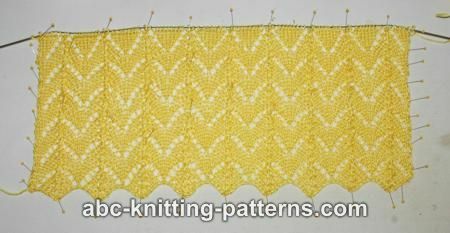 On this pattern, I would work all stitches until you only have 3 left, at that point, I would to a yarn over and then continue knitting the remaining 3 stitches. Once you turn the work, you will purl 3 and then purl 2 together (you will purl the yarn over and the original stitch together) this will get you back to the original number of stitches you had. It is up to you to decide how many buttonholes you want. 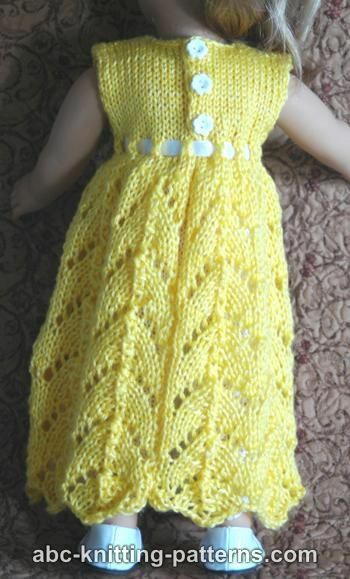 I made small crochet chains and sewed them on the dress as loops. It worked but I should have asked someone who crochets to do it for me. Hope you've found something that works.